The team’s work established that an antibody that disrupts the complex may have therapeutic potential. Almost 12 million patients are given heparin annually either as treatment for clots or to prevent clot formation, for example, during cardiopulmonary bypass surgery. A team from the lab of Mark Greene, MD, PhD, the John W. Eckman Professor of Medical Science, including Zheng Cai, PhD, senior research investigator, as well as the lab of Douglas Cines, MD, director of the Coagulation Laboratory and a professor of Pathology and Laboratory Medicine, solved the crystal structure of the pathogenic immune complex and elucidated the structural basis by which another, potentially therapeutic, antibody disrupts this structure. HIT (heparin-induced thrombocytopenia) is an autoimmune blood disorder caused by complexes that form among these components: platelet factor 4 (PF4), which is released when platelets are activated; heparin; and antibodies to PF4. As many as one percent of patients who receive a certain type of heparin for at least five days develop HIT. These patients make antibodies that bind to the heparin-PF4 complex. These antibodies in turn trigger platelets to form clumps. These aggregates, along with other cells, cause blood clots to form, leading to an overall decrease in platelets. About half of all patients with HIT also develop arterial or venous clotting, which is often recurrent and can be deadly or require amputation. Current therapy with intense and irreversible anticoagulation lowers the risk of recurrence, but the risk of limb loss and death remain high and the risk of bleeding as a result of therapy is considerable. HIT can be difficult to diagnosis definitely, leading to many patients receiving this high-risk therapy unnecessarily. This treatment conundrum has prompted the search for new ways to treat HIT. The team started their hunt by detailing the structure of the components of the antigen-antibody complex at the root of HIT. First, they solved the crystal structure of PF4 in the presence of a critical part of the heparin molecule. In the blood, PF4 molecules can exist singly as monomers, doubly as dimers, and as a four-part complex called a tetramer, which have an “open” end and a “closed” end. Their new crystal structure showed that heparin bound to the “closed” end of the PF4 tetramer, which stabilized the tetramer. They next solved the crystal structure of PF4 in complex with a pathogenic antibody called KKO. Developed by coauthor Gowthami Arepally at Duke University, with coauthors Mortimer Poncz and Lubica Raouva, from The Children’s Hospital of Philadelphia, KKO causes a HIT-like disease in a mouse model. This crystal structure revealed that KKO bound to the “open” end of the stabilized tetramers, making contact with three out of four monomers in the tetramer. This helped to explain the requirement for heparin as a backbone for the complex. This finding provides new insight into how a normal host protein, in this case PF4, can be converted into a target of the host immune system, leading to the development of an autoimmune disorder. They studied a second antibody developed by Arepally, called RTO, which also binds to PF4, but does not cause a HIT-like disease. 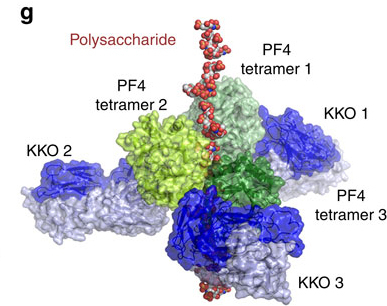 They found that in the crystal structure of PF4 in complex with RTO, this antibody bound to PF4 monomers rather than tetramers. More importantly, RTO binds to PF4 monomers in a way that the team predicted would prevent PF4 monomers from combining into tetramers. They then confirmed that RTO prevented formation of antigenic complexes, activation of platelets by KKO and by human HIT antibodies in cell experiments. The researchers also prevented clot formation caused by KKO in a mouse model of HIT. The upshot of this sequence of experiments is that binding of RTO to PF4 monomers prevents formation, and indeed disrupts, pathogenic complexes that are central to the pathology of HIT. The investigators believe that the antibody RTO will provide the basis for new diagnostics and may pave the way for a therapy to stop the disorder early in its progression.